The year 2017 saw the ninth presentation of the International DAM Architectural Book Award, by the Frankfurt Book Fair and the German Museum of Architecture (Deutsches Architekturmuseum, DAM). This unique and highly respected prize honours the year’s best books on architecture. 89 publishers of architecture and art books from all over the world entered the 2017 contest. A panel of external experts and DAM representatives met on 13 September 2017 to select the year’s ten best architecture books from 215 entrants, based on criteria such as design, content concept, material and production quality, innovation, and topicality. More about the Book Award 2017. 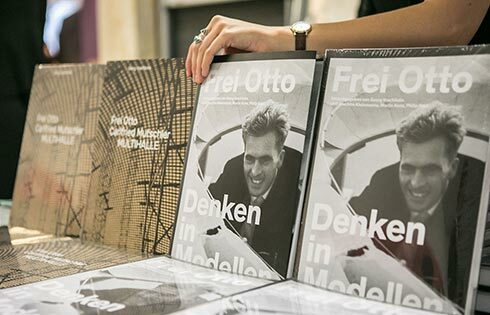 One of the winners was the newly released “Frei Otto. Denken in Modellen” (“Thinking by Modeling”), published by Georg Vrachliotis and the Südwestdeutsche Archiv für Architektur und Ingenieurbau (saai) at the Karlsruhe Institute for Technology (KIT). Congratulations!